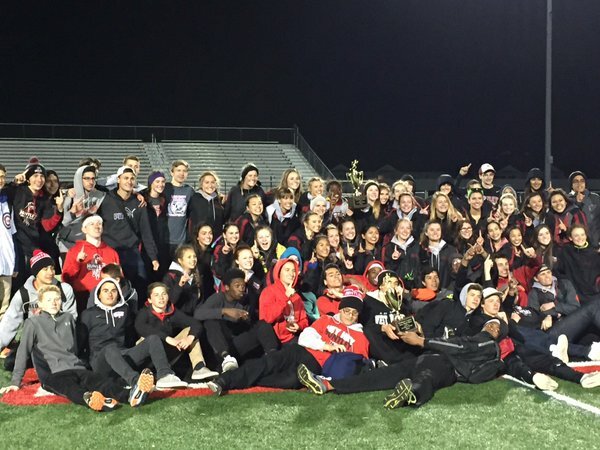 The boys and girls track teams pose with their McHenry County trophies (Courtesy of Huntley Athletics). 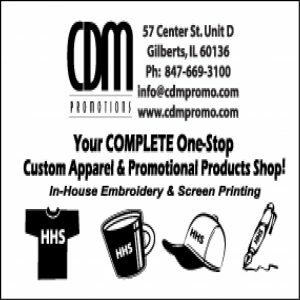 In what appears to be an annual tradition, the Huntley Red Raiders boys and girls track teams put up strong performances on Thursday and Friday night at the McHenry County Track Meet. The boys won their fifth consecutive title, scoring 177.5 points, demolishing Jacobs, who finished second with 88 points. The girls won their first county championship in program history, besting Cary-Grove, who had narrowly beat them last year, 128-108. The meet began on Thursday night with the field events. The girls got off to a quick start in the high jump, with sophomore McKenzie Krich and junior Morgan O’Connor placing 2nd and 4th, respectively. The Raiders’ strong performances continued into the throwing events, with senior Sarah Henderson coming up huge with a 2nd place finish in both the shot put and discus. Sophomore Katie Bessey was able to place 8th to score key points for the Raiders. The girls were able to score points in every single field event, with sophomore Rhian Whitfield finishing 6th in the pole vault, sophomore Cassidy Lackovic finishing 6th in the long jump, and sophomore Chloe Smith finishing 5th in the triple jump. Just like the girls, the boys dominated in the field events. Star senior thrower Tim McCloyn won both the shot put and the discus, while fellow senior Dominic Swanson placed 2nd in the shot put and 3rd in the discus. Senior Sean Patel joined McCloyn as an individual champion by capturing titles in both the long jump and triple jump. Patel set a new school record in the triple jump with a distance of 44 feet, 2.5 inches. Senior Max Trinski, junior Rafael Rivera, and sophomore Melvin Bonsu joined McCloyn, Swanson, and Patel as all-county performers. Trinski tied for 7th in the high jump, Rivera placed 3rd in the pole vault, and Bonsu placed 8th in the long jump. All three scored crucial points that helped Huntley widen it’s already significant lead. Heading into Friday, when the running events would begin, the boys were in first with 62.5 points, narrowly ahead of McHenry, with 52 points. Meanwhile, the girls trailed Cary-Grove 60-40. Friday kicked off with the 4×800 meter relay. The girls and the boys put up fantastic times, and both finished 1st. The girls team, which consisted of seniors Kate Mitchell and Kiera Daly, freshman Mary Raclawski, and Smith, finished with a time of 9:42.9. The boys ran an all-senior team of Seth Conroy, Keagan Smith, Mike Grocholski, and Zach Hollman. They ran 7:57.06. Both teams set new county records for the event. The girls had their minds set on setting a new record heading into the meet, and they knew it was a strong possibility. Both teams 4×100 meter relay teams were able to continue Huntley’s running dominance. Both teams placed 1st, with the girls team of seniors Nicole Zielinski, Alyssa Bushman, sophomore Alex Handchetz, and Lackovic running 50.48. The boys team, which was made up of seniors Ben Marsh and Jeremie Allen, along with sophomores Dubem Anikamadu and Eric Mooney, ran 42.75. The girls were able to earn critical points in both the 3200 and 100 meter high hurdles. Sophomores Lindsey Ferguson and Olivia Boncosky finished 4th and 8th, respectively, in the 3200, while Whitfield and fellow sophomore Tyra Miller finished 7th and 8th, respectively, in the hurdles. Unfortunately, the boys were unable to score any points in the 3200 meter run. However, sophomore Lukas Bolas’ 2nd place finish in the 110 meter high hurdles put the Raiders back on track to continue their dominant performance. Junior Brian Bala joined Bolas as a medalist in the hurdles, placing 4th. The 100 meter dash saw both the boys and girls continue to capture individual championships, as Lackovic claimed the girls crown with a time of 12.68 seconds, while Anikamadu claimed the title in the boys’ race with a time of 11.04. Bushman and Marsh also medalled in the 100, with Bushman finishing 7th for the girls and Marsh finishing 4th for the boys. 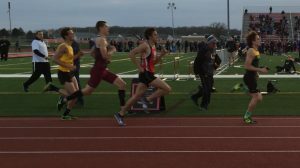 Raclawski and Mitchell continued to score points for Huntley, as Raclawski claimed a 2nd place finish in the 800 meter run and Mitchell was close behind in 5th place. However, the best 800 performance on the day belong to Keagan Smith. Not only did he capture the individual title with a time of 1:55.75, his time set a new county record, breaking the previous 43-year-old record held by John Enright of Crystal Lake Community. Senior Keagan Smith chases down Jon Prus of Crystal Lake South in his record-setting 800 meter run. The boys won their 3rd relay of the day with a victory in the 4×200 relay. Their team, Marsh, Allen, Mooney, and Anikamadu, ran a time of 1:29.98, setting a new county record. The girls team finished 2nd in the event behind Crystal Lake South. For the boys, their dominance was expected. The girls were able to wrap up their meet by placing runners in the top eight in three of the last five events. Freshman Ola Oladipo placed 4th in the 400 meter run, while Lackovic and Handchetz finished 2nd and 5th, respectively, in the 200 meter dash. The girls ended the night on a high note, with their 4×400 relay team of Mitchell, Daly, Oladipo, and Bushman taking home the title with a time of 4:15.45. Meanwhile, the boys were even more dominant, winning three of the final five events, and placing at least one runner in the top eight in all five of the events. Senior Brendan O’Donnell finished 2nd in the 400 meter run behind Myles Rozell of Johnsburg. Junior Ben Stevens finished 7th in the event. Junior Sam Pitrone took home the 300 meter low hurdle title in a time of 40.46 seconds, and senior Trevor Dell’Aquilla joined him as an all-county member with a 7th place performance. 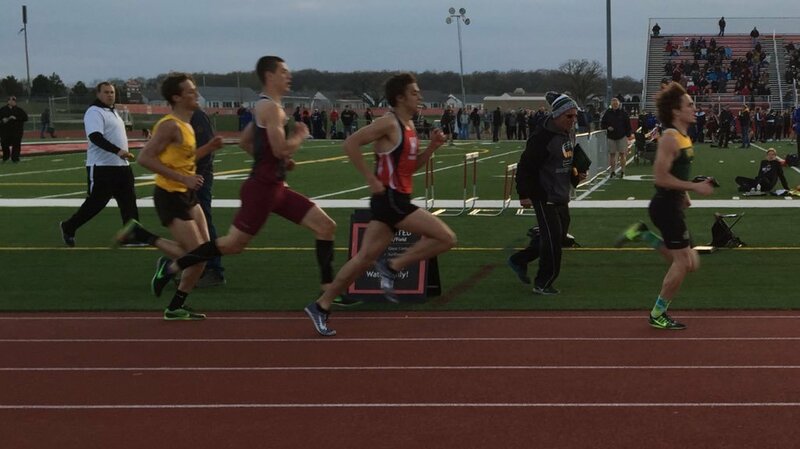 Conroy finished 4th in a tough 1600 meter race that was won by Crystal Lake Central’s Cole Barkocy, while Allen took home the 200 meter dash title with a time of 22.24, narrowly besting Steven Bellafontaine of Jacobs. The boys also were able to sweep the relays at the meet, with their 4×400 team of Dell’Aquilla, O’Donnell, Stevens, and Keagan Smith finishing 1st in a time of 3:28.25. Both teams performed admirably throughout the meet. Winning five county championships in a row is no small feat, and the boys did a great job of staying motivated at a meet they’ve been able to dominate recently. Next year will be a much tougher battle to earn a 6th straight title, but returning runners like Stevens, Anikamadu, and Mooney will ensure the Raiders have solid base to build on. For the graduating seniors, their victory signalled an important milestone, as they will finish high school without ever losing a county meet. The girls also did a fantastic job at the meet. It can be difficult to remain focused after having narrowly finished 2nd so many years in a row, but they came out looking to prove they were the best team in the area and they left little doubt that they can contend with some of the bigger schools in the state. Although they’ll lose some key performers, like Mitchell, Daly, Henderson, Zielinski, and Bushman, they had a lot of fantastic performances from underclassmen and should remain a strong team in the coming years. Winning the program’s first county title is special for everyone, but it meant a little more for the seniors. Both teams will continue their season on Monday, April 25. The boys will face off against McHenry and Crystal Lake South in McHenry. The girls head to Prairie Ridge to compete against Crystal Lake Central, Prairie Ridge, and Woodstock North.